Geological information has been derived from the Geological Map 1997 of the Department of Geology. Unfortunately, it does not cover the northern part of the Nam Ton watershed. The geology of the Nam Ton Watershed is quite diverse, comprising of 11 different geological formations. 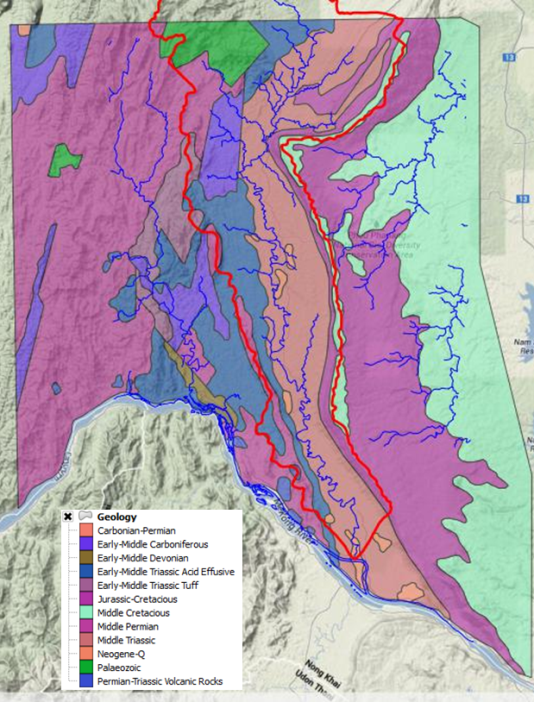 The most extended formation (32 % of Nam Ton watershed area) is the middle Triassic which occurs along the Nam Ton River. This formation is also a significant storage layer for groundwater. Early-Middle Triassic Acid Effusive (Phu Lek Phay formation) accounts for 17% and Middle Permian (Houei La formation) has a share of about 11%, both are located in the western part. NTPA). Depending on the geological formation the parent material varies greatly and comprises of sandstone of different colours, limestone, claystone, siltstone, conglomerates, basalts, tuffs, etc. Mesozoic sediments deposited from the former continental ocean define much of the lithology of the NTPA, as evidenced by the large proportion of calcium carbonate, sodium salts, sandstone and gypsum (Bhakdi 2007).